I’ve an uncle who swears that our recipe for Bacon Jalapeño Pull-Apart Bread came about when renowned Tuscan explorer Amerigo Vespucci (yes, fellow Americans, we borrowed our name from his) partied with travelling Aztec pepper merchants. 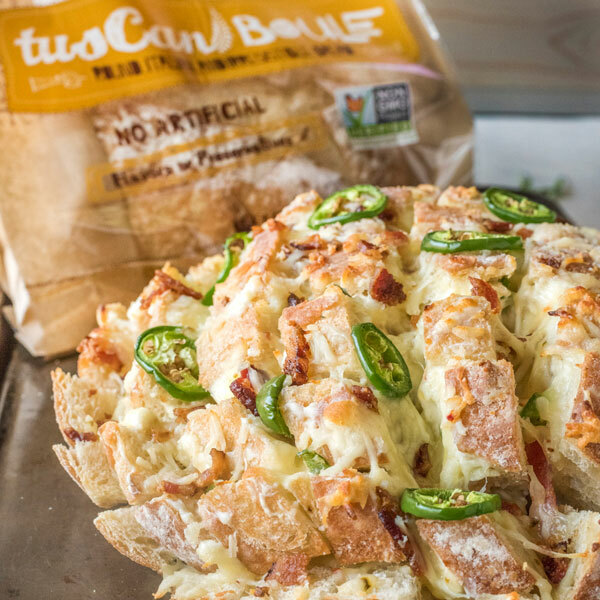 Now because Amerigo was down to his last Tuscan Boule, and the Aztec pepper merchants could only offer jalapenos, they combined their resources into what was the very first Bacon Jalapeno Pull-Apart Bread. So hungry were they after whipping up this impromptu delight that they dispensed with table manners and tore the loaf apart, hence the name. At Grace Baking we took it upon ourselves to add bacon, three spectacular cheeses, garlic, and incorporated them into one of our moist, soft, subtly delicious Tuscan Boules. Needless to say Amerigo Vespucci would have been impressed. We were. Preheat oven to 350ºF. Cut boule in a crosshatch pattern almost to the bottom of the loaf, without cutting all the way through, and place on a baking sheet. Slice one jalapeño into thin rings and set aside. Dice second jalapeño and add to a small bowl with the cream cheese, garlic powder and onion powder. Stir together. Using a spoon, stuff cream cheese mixture into the cuts in the boule, ensuring every cut is filled. Stuff shredded cheeses, bacon and sliced jalapeños into the boule and cover with foil. Transfer baking sheet to oven, and bake boule until cheese is melted (approximately 20-25 minutes) Remove the foil and bake uncovered for an additional 5 minutes before serving.